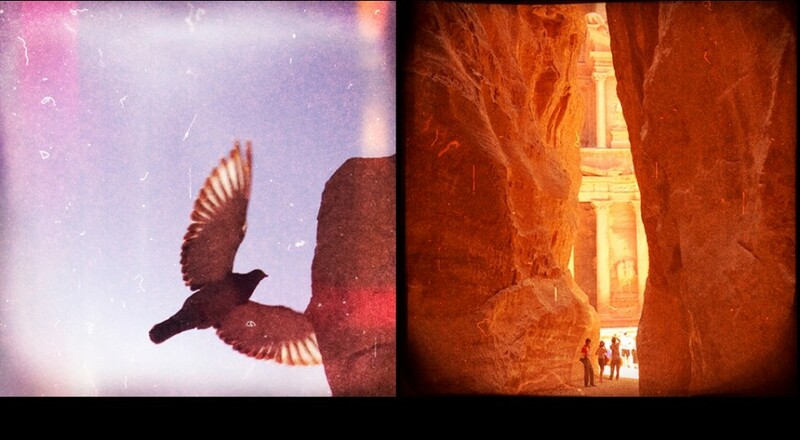 Photographer Aya Padrón journals images and memories from a recent trip to Jordan. IT’S SO HOT the sky looks greenish where it meets the horizon, and when I notice, it makes me feel a little carsick. I fix my eyes on a distant point, happens to be a gold church dome, and wait a second for the nausea to pass. Probably has something to do with the flies, whirring at the corners of my lips and recklessly close to my nose. Swatting is futile, but I do it anyway. It actually makes me feel a lot less annoyed. Swat, swat, swat. Flies reel in every direction. Their buzzing doesn’t intermit, though. Doesn’t even skip a beat. Arms going like a windmill, I hurry down the thicket path. Everyone else is way, waaay ahead, as usual. Once I separate my trigger finger from the shutter button, it’s obvious that this salt cedar branch isn’t going to transmute into anything more than a stockpile of bland photos. While I’ve been manning the focus ring, everyone else’s been hustling toward our destination, the baptismal site, swatting doubletime. They might already be there. Or even ready to go. I picture them standing around, bored, tapping their watches amid the flies. Making them wait again. And I still have so many pictures to take. Maybe I should run. Of course, no one cares about my late arrival when I emerge from the salt-cedar thicket brandishing my camera. We all wind up doing the same thing, shuffling along a fence that separates tourists from the sunken spot-that-was-once-a-river where Jesus was baptized. I think we look like a mob of borg, our cameras some kind of bionic eyeball prosthesis. It’s a thought that makes me happy, and I start to take my shuffling more seriously. These days the site is pretty dry, for baptisms at least. This is something I didn’t expect. The Catholic kid inside me gets a little disappointed. Because in her daydreams during mass at Saint Gabe’s, the baptismal scene was quite an overstatement. In fairness to that little kid, there is, of course, some pretty grand stuff in the Bible about what happened here. All I can remember are snippets. But I’m pretty sure there’s something about the heavens opening and the spirit of God swooping down in the form of a dove. Naturally, being event-specific, the Bible’s grandiosity in this matter wouldn’t always be applicable to the venue itself. But in all the years since I first dreamed it up, revisiting my childhood interpretation of the baptism site never crossed my mind. So my adult self is a little let down by the normalness, too. A little rueful, I stare at the desiccated trench and the small chapel. Then I try to synch the scene with the ridiculously mismatched tableau from my imagination. First, I conjure up some robed figures. Next, I spend a few minutes filling the dry pit with plenty of imaginary water for John’s use in the ritual. I get a kick out of it. I decide it’s pretty cool that I’m here. When she grows up, my little-kid self is going to be so psyched about this.